The approach we take as observers is that of a technician with a tool-bag. Multiple paradigmatic approaches to any situation in turn reveal more inclusive perspective and thus inclusive information. It is the author’s superfluous intent to include multiple aspects of proposition of existence and therefore provide a network model of information that works from the outside in, slowly reinforcing a single relative idea through multiple approaches. In term’s of relativity, why bring one camera to the show when we can bring three hundred? As with any popular media, multiple cameras are infused to create a view of singular perspective, thus shall the Aeris Argumentum. The canvas before us is a collection of individual paintings, a puzzle of pieces, and multiple approaches to any one situation thus include a glimpse of the entire canvas, and as such, the author strives to provide more tools via perspective. Whereas a single tool provided by a single observation, lends a hand at a single solution, and as such multiple perspectives show us more of the entire picture, and as such, as observers, it is our duty to include multiple perspectives in our approaches. This research, which is collective network of individual research, all serves to create and reinforce a single proposition, via a propositional network implementation of unitary inference, the network breeds itself, and thus reinforces itself, as a single whole. As global warming advocates place emphasis on Carbon Dioxide, as will the Argumentum, but multiple perspectives are necessary to grasp the whole picture, and thus the whole truth, and inclusive propositions of Sulfuric Acids, Sulfuric Dioxide, Chlorine Radicals & Silicates, Hydro-Chloride, Economics, Physics, Astrophysics, as well as Intra-Thermonuclear expansion and Volcanic Emission vs Human Emission shall too be included in our approach. It is also the author’s intent to provide psychological references to paradigm, as each perspective hold’s a different view, every premise is equally as deniable as their conclusions, and as observations are limited to paradigm, and thus perspective, despite facts presented within any theory, all are equally as unprovable. This is why the author formats the Aeris Argumentum as a network or directory of approaches, all being converted into a single language, Western English, which is a foundation of finite and physical science, and thus limited by finite paradigm and so our format will provide syllogism and logic through medium of approach. The underlying focus of a network approach is again, to see the entire picture as a collection of truths, and as such we are to include multiple observation, instead of focuses of Carbon Dioxide, we are to broaden our search and perspective, as it is those who think they know something, that stop searching. My intent is then to provide more perspectives, more tools, and as the human observational device can thus switch between perspective to arrive at whole inclusive truth, so we will now. We must include all perspectives to see the whole truth. Various forms of research indicate that Earth, just as Venus, is undergoing effects of Thermonuclear Expansion, just as when we boil tea, bubbles of gas form seeking a way out, thus expanding our medium to a greater size, and as the earth has expanded, and as we have never ventured to the center of our planet, it assumed physically the same laws of thermodynamics apply, and thus the same processes have occurred deep within our planet’s core over the course of 180 million years ago. As heat and radiation drive toward the surface at every moment, the only way to then expel this heat is through a wide variety of vents and thus volcanoes which naturally control planetary climate, and have been throughout Earth’s history, via discovered information discerning Earth’s Ice-Ages as well as Venus. Our Earth is expanding due to a on-going intra-core thermonuclear explosion taking place over 180 million years ago, and until that core-heat reaches the surface (est 60,000 yrs), cooling patterns are eventuated due to atmospheric increase in volume, via surface expansion. Volcanism will increase in frequency and intensity causing the Earth to enter its final ice-age, which will last abruptly 10,000 years. Core-heat will cause global surface temperatures to rise, ending the ice-age, and that as more and more core-heat reaches the surface, Earth’s future will move to a Venus-type scenario. Volcanic emissions surpass that of human emissions in terms of Sulfuric Acids and Carbon Silicates, which also react with the suspended stratospheric ice crystals formed in abundance over the polar caps where it is naturally cooler due to Earth’s cycles of orbit, wobble, and tilt, thus forming Chlorine Radicals which deplete ozone. Under stratospheric conditions there exists no wind, making human emission less probable as to their affect. Economic conditions reinforce ‘Green’ ideology to ensure economic profits. Earth’s cycles of orbit, tilt, and wobble reinforce global mean cooling, including Earth’s 100,000 year cycle of orbit, the 41,000 year cycle in the tilt of Earth’s axis, and a 23,000 year cycle in the wobble of the axis. Despite areas of ozone depletion, global mean temperatures continue to drop, and have been dropping since 1940. Polar warming is only a process and function of global cooling, and as the ice caps melt, weather patterns increase, naturally spreading the water evenly across Earth’s surface until more solar radiation is reflected than absorbed, to the point where global mean temperature drops below that of water’s evaporation temperature, equating to colder conditions. 11-14 year cycles of solar radiation naturally deplete ozone levels. Human CFC and C02 emissions only serve to occlude the Earth’s natural global cooling plans, and as cooling will hinder organic life as well as devastate humane conditions into greater obstacle, naturally fighting this problem will preserve life via greenhouse emission. The United States law of refusal of R-22 is due to Dupont’s economic influence with R-410a, which is 4-8x expensive, and by banning R-22 we create profits for several refrigeration organizations (refrigerant and mechanical), and as refrigeration is a necessity for consumers, this creates large profits and thus information is being deceitfully presented in order to back economics and monopoly. The Earth, via on-going thermonuclear explosion, controls it’s own temperatures, and has been even before humanity came into existence, including the 4 ice-ages of the past. Increased volcanism will cause major climatic changes worldwide including: Increased cold, frost, storms, crop-failures, droughts, floods, hurricanes, and other disasters. Greenhouse gases tend to trap solar heat and to prevent it from re-radiating out of the biosphere. Ozone depletion results in a greater percentage of incoming solar energy reaching the biosphere. Both Greenhouse and ozone effects operate to heat up the biosphere. Volcanism, on the other hand, operates to cool the biosphere and is, generally, harmful to organic life. The Earth is heating up, by reason of the on-going core explosion occurring 180 million years ago and the Greenhouse effect, however, the biosphere is cooling, due to increasing levels of volcanic ash in atmosphere, which reduce biosphere insulation, and predominate over the greenhouse layer of gas. All of the four ice ages of the last one million years began when volcanic activity in the low latitudes was extraordinarily vigorous. When volcanism reaches a high altitude, its dust levels, within the stratosphere, forming a veil of dust, and has a cooling effect which is greater than the heating effect caused by its carbon dioxide emissions (Greenhouse effect). Such has been the case during the last 4 Quaternary ice ages. Climatic changes may be unpredictable, large and sudden and may not necessarily always be warming. A 5% drop in the amount of solar radiation reaching the surface could cause the global mean temperature to fall by as much as five degrees Celsius. Greater incidence of icebergs and drift-ice. Increased South-North/North-South air-flows, with reduced East-West/West-East air-flows. Greater latitudinal uniformity of climate. Decrease of sea level waters. Volcanism increases and enhances the stratospheric de-insulation layer of sulfuric dust and results in decreased biospheric mean temperatures, and also results in a heating up of the stratosphere both at and above the de-insulation layer. During lulls between volcanic activities the de-insulation layer weakens and the summer temperatures rise. As the warm stratosphere reduces the power of the altitudinal heat-sink, an oven effect comes into play, followed by increased North-South/South-North air-flows to higher latitudes, and a decrease of East-West/West-East air-flows. However, the cooling effect reasserts its dominance in the winter as the earth moves it’s orbit from the source of solar radiation. The increased North-South/South-North air-flows increase rainfalls generally and, in winter, this builds the incidence of snow, ice, and cold land-waters particularly in the mid-latitudes. The evidence (of carbon dioxide levels in marine micro-fossils) indicates that the previous interglacial, which ended 75,000 years ago, had high carbon dioxide levels and was even warmer than the present interglacial but still this was unable to prevent or preclude the onset of the last ice-age. Current high carbon dioxide levels (and their greenhouse effects) will probably not prevent the onset of another ice-age. There has been a high correlation between temperature levels and carbon dioxide levels over the past 160,000 years. This, of course, is not in itself proof that high levels of carbon dioxide cause global warming or prevent global cooling. The warmer the oceans, the more carbon dioxide is released from oceans into atmosphere. When the ice sheets began to melt about 16,000 years ago, the quantities of atmospheric carbon dioxide increased rapidly. The sulfurous aerosols, emitted by volcanic activity, de-insulate at 15-30 kilometers altitude while the heavier carbon dioxide emissions remain at a much lower altitude. The cooling effects of volcanism predominate over heating effects of carbon dioxide. An increased level of atmospheric carbon dioxide raises temperature, via the greenhouse effect, and results in increased evaporation and rainfall. As surface waters increase, their albedo effect reduces temperature, which reduces the level of atmospheric carbon dioxide. Dry conditions promote forest fires, which produce soot, which absorbs solar radiation, which heats the biosphere via carbon dioxide. Volcanic activity releases approximately one billion kilograms of sulfur annually, as sulfur dioxide. The mass of natural aerosols in atmosphere is estimated to be 4-5 times greater than the mass of man-produced aerosols in atmosphere, on a global scale. It is estimated that approximately 50% of carbon dioxide produced from fossil-fuel burning is taken up by the oceans. THE Aeris Argumentum introduces and expands upon the theory of intra-explosion, which is what has created the Earth’s ventilation system, and through this system of volcanoes and vents, the Earth naturally ejects (and creates) it’s own atmosphere with climate controlling gasses, and in a greater capacitance than that of man kind emissions. Before the thermonuclear explosion of 180 million years ago, the Earth’s inner core consisted, as now, of primitive undifferentiated solar matter, and mainly of hydrogen. Such an inheritance of radioactive inner-core material provided the hydrogen isotopes and preconditions for a thermonuclear explosion sequence to eventuate. As contraction of the cooling mantle progressively reduced the volume of the inner-core plasma, the temperature/pressure of the plasma increased (as to the square of the constricting/pinch energy applied), causing a thermonuclear explosion to occur. The Earth’s active ventilation system, including ‘blow-out’ areas such as volcanoes were established during this early period and continue to expel the expanding matter and as it rises out from the core. Energy is lost as the flowing matter is moved further away from the heated core, and matter changes state from plasma, to gas, to liquid, to solid (land). As escaping matter is thus cooled throughout the journey from the core, the ‘vents’ often ‘clog’, thus reinforcing thermonuclear explosion. The pressure/temperature created by these conditions reinforce the reaction and perpetuate it as the earth begins to expand and move due to inner-exploding conditions. The core-explosion heat, coming closer to the surface, is the cause of increased volcanism over the past two million years, and its accompanying ice-ages. The episodic pattern of quaternary volcanism and ice-ages, is probably due to convection variations in various parts of the mantle. The pre-explosion scenario we refer to of 250-180 million years ago is worthy of note. During this 70 million year period of the Triassic and Jurassic eras, the Earth’s surface was all land and conformed to a tight and crunched aggregated land mass, known as Pangea, totaling to 52 million square miles in area. Thus, the pre-explosion land area was 5 million square miles less than the present total land area of 57 million square miles. ‘New’, post-explosion lands include north-eastern Siberia, a large part of south-east Asia, Japan, Philippines, Indonesia, East Indies, west coasts of North and South America, Central America, West Indies, Turkey, northern Iraq, and Iran. The Earth, of 250-180 million years ago, had become contracted to a volume of 35 billion cubic miles, as compared with the present 258 billion cubic miles. Earth mass remained constant throughout Earth-history and, in the period before the explosion, surface gravity was high. All of the then land masses had become jammed together, and buckling and lifting had taken place due to the contraction and subsidence of the underlying lithosphere causing large fissures to open up, through which most surface waters drained back into the mantle. The Earth’s surface was dry and barren, and gravity was high, and we are to note that approximately 95% of the then flora and fauna died. New land and crustal additions most commonly issue from construction ridges formed from the thermonuclear explosion. Of the 145 million square miles added to the surface since the core explosion 180 million years ago, only 5 million square miles have been by way of additions to land, whereas 140 million have been by way of ocean-floor extensions. (Note: Six million square miles were technically added to land, but one sixth was lost to subsidence and inundation). (1) Lands added during the initial blow-out period (180-140 million years ago) – approximately 3.0 million square miles. (2) Lands added by subduction-forced uplift, where major sections of ocean-floors have been subducted under continental coasts (primarily, the west coasts of the Americas) – approximately 1.5 million square miles. 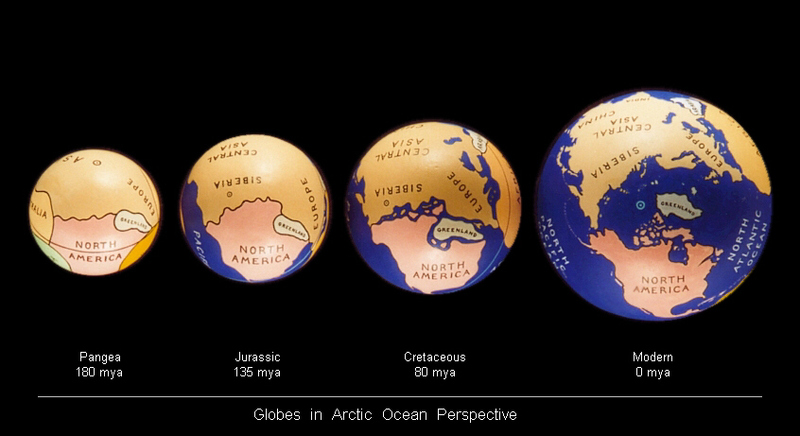 (3) Lands added interstitially, as ocean floors precessed continental land-masses. The Pacific ocean floor has precessed the Euro-Asian land-mass eastwards, causing new lands to rise and the numerous additions include parts of Japan, Philippines, Indonesia, northern New Guinea, New Caledonia, northern New Zealand, and many smaller west Pacific islands – approximately 1.0 million square miles. (4) Lands added, by sedimentary construction, in river delta areas – approximately 0.5 million square miles. The geological area known as The Mariana Trench was the greatest ‘blow-out’ zone of the core explosion 180 million years ago. The Mariana Trench formed from this explosion occurring 180 million years ago opening up a seaway between the south Asia coast and India. The associated oceanic construction ridge fed out and spread fan-wise eastwards, creating the early Indian ocean floor and then the Pacific Ocean floor. The core explosion caused the Earth’s volume to expand, and vast areas of new ocean floor were created. Most of the Pacific ocean crust has issued from the rapidly growing construction ridge which had its origin in the Mariana Trench blow-out of 180 million years ago. The Tongan and Kermadec Trenches marked the 180 million year ago separation of the eastern coasts, of Australia and Antarctica, from the western coast of North America. Before the core explosion 180 million years ago, the coasts of southwestern Europe were adjacent to the west African coast, and Gibralta was adjacent to Cape Palmas. 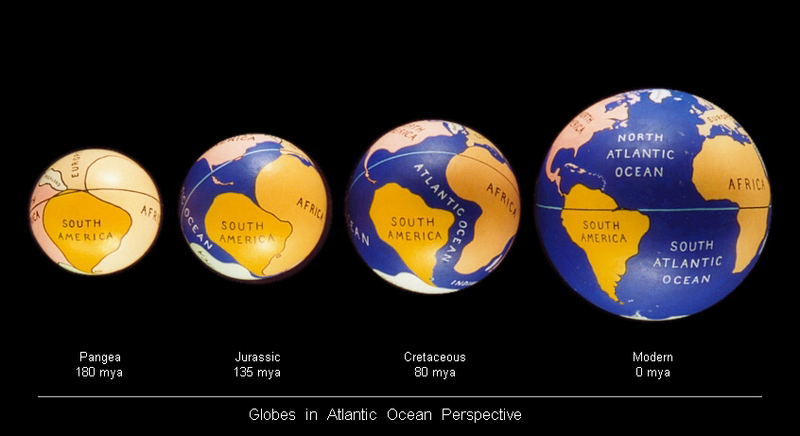 The 180 million year ago blow-out caused these coasts to separate, and a seaway was opened up, and southern Europe moved 1,500 miles east relative to the African coasts, all Pangean crust split into two major assemblies – the northern (Euro-Asia, North America and Greenland), and the southern (Africa, Arabia, India, South America, Antarctica and Australia). The northern assembly was 23.4 million square miles in area, and the southern was 28.6 million square miles and the old Pangean crust was split into two halves, and a continuous seaway opened up between the two assemblies. 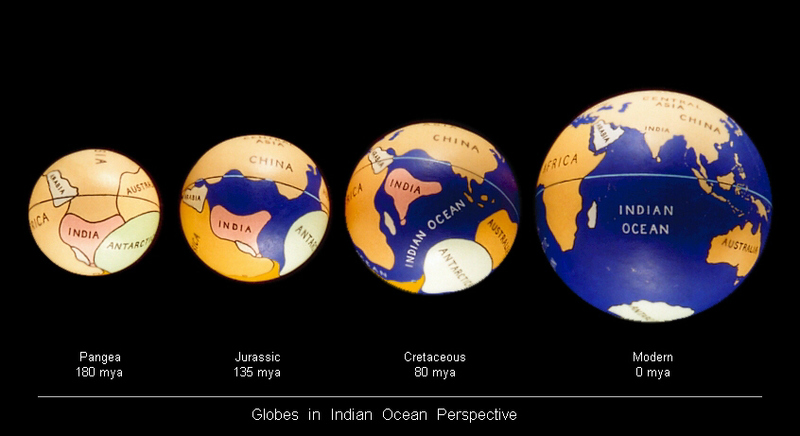 As described, the center of the 180 million year ago surface blow-out was the Marianas Trench, situated then between Northern India and the Euro-Asian continent. The Marianas blow-out developed into the Pacific construction ridge. The point made now is that the 180 million year ago blow-out caused huge fissures to open up along the line of separation of the northern and southern assemblies. The Philippines, Marianas, Bonin, Izu, Japan, Kuril, Aleutian, Tongan and Kermadec deep-trenches formed one continuous crack-line, at the 180 million year ago blow-out. Only the Marianas section became a major construction system. 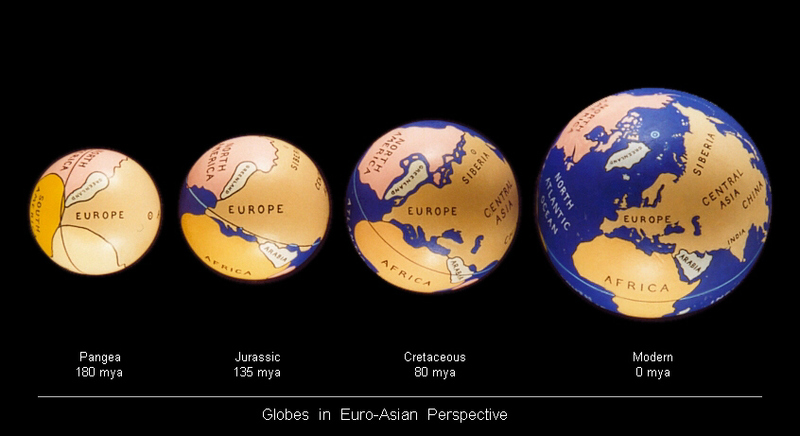 From the blow-out of 180 million years ago , the Philippines Trench opened up along the Somali Peninsula and the margin of South Arabia; the Marianas Trench continued across northern India; the Bonin-Izu-Japan-Kuril-Aleutian trenches continued from northern India around the north-west, northern and north-east coasts of Australia. And the Tongan/Kermadec Trenches continued down the east coast of Australia and the then adjacent coast of Antarctica. This crack-line divided India and Australia, on the south, from Euro-Asia on the north, and western North America from Australia and Antarctica. 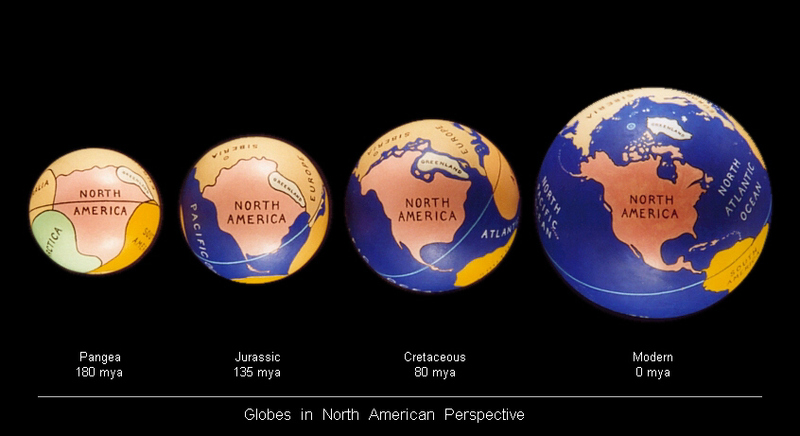 As noted in the expansion models, great land masses have developed and in fact moved further apart. The development of the ocean floors has greatly changed the relative positioning of the deep-trenches. The Tongan-Kermadec Trenches are now separated from the Kuril Trench by 4,500 miles of ocean floors. None of these floors existed 180 million years ago. The Tongan-Kermadec Trenches remained adjacent to Australia and Antarctica until Australia moved north and away from Antarctic, about 45 million years ago. The relative positioning of the deep-trench Philippines to Kuril line has changed dramatically in relation to the Asian coast. The south Asian coast has moved 1,500 miles east relative to north Africa since 180 million years ago and the Indian Ocean has opened up, and also the South China and Philippine Seas. Further, the inertial drag, of Euro-Asia, has caused the Pacific Ocean floors to precess the Asian land-mass, moving the southern section of the trench system further away from Asia. The net result of all these factors has been the removal of the Philippines Trench to its present position 4,500 miles east of its 180 million year ago ‘birthplace’ alongside the Somali and Arabian coasts. The Mid-Atlantic construction ridge has a rate of divergence of about 5cms per year., while the East-Pacific ridge has a rate of divergence of about 15cms per year. Since 140 million years ago, the under-ocean construction ridge system has been developing and extending, and became an effective mechanism for the production of new Earth-crust, that is until 2 million years ago. At that stage, under-ocean construction ridge activity became frustrated around the Pacific rim, and resulted in a major upsurge of land volcanism, accompanied by ice-ages (consequent upon a build-up of the stratospheric de-insulation layer via volcanic emissions). Throughout Earth-history, it has been rare for the poles to be covered with ice but, during the past 2 million years, the poles have been continually iced. The Aeries Argumentum argues the primary cause of this icing has been the greater incidence of volcanic emissions, with their de-insulating effect via the stratospheric veil. From 220-3 million years ago, the Earth’s climate was fairly uniform. The tropical and sub-tropical belts extended down to the mid-latitudes, and the cold belts were in the high latitudes close to the poles. There is some evidence that the Earth’s mean air temperature dropped from 23 degrees C to 17 degrees C over the period 80-20 million years ago and that mean air temperatures below 14 degrees C (the present level) have been confined to the past 2.5 million years. From this evidence, we may speculate that volcanism may have increased gradually from 80 million years ago and intensified over the past 2.5 million years, as volcanic emissions and the stratospheric veil of dust serve to cool the earth. At least two ice-ages occurred between 2.5 and .5 million years ago and at least four ice-ages occurred between .5 million years ago and 10,000 years ago. The theory developed within the Aeries Argumentum is that core-explosion heat is coming ever closer to the surface and as it does so volcanism increases progressively and with it increasing stratospheric de-insulation, creating ice-ages. The theory includes the concept that the Earth, as a whole, is heating up and that the biosphere is cooling in this penultimate phase but that, when the core-explosion heat actually reaches the surface, a Venus-type scenario will develop. In the present interglacial period, temperature peaked about 4,000-6,000 years ago. The Earth’s mean air temperature is now dropping, as the Earth heads towards another ice-age. The suddenness of onset of the next ice-age will depend on the incidence of de-insulating volcanism. As the world’s climate has been cooling since 1940, and as the onset of an ice-age may occur within a 100-year (or less) period, we may be well advanced in a phase of ice-age re-entry. (1) That, the ice-ages follow a trend of progressively colder temperatures, progressing past the cold-peak of each ice-age, as the series approaches present time. (2) That, of the past 70,000 years, only the last 10,000 years have been close to present day temperatures. (3) That, over the past 2.5 million years, temperatures have been lower than present 63% of the time. (4) That, over the past 70,000 years, temperatures have been lower than present 91% of the time. As upsurges of volcanism are the proximate causes of ice-ages, the de-insulating (cooling) effects of volcanism must dominate over, and affect the ozone depletion (heating) effects of volcanism. Once a period of cold has been started, its own effects tend to intensify it even by short periods of heating (inter-glacial periods). As ice accumulates, it reflects more and more of the solar heat back into space, and period heating patterns are required to influence the weather and climate patterns to distribute the water across the surface of the earth in order to eventuate this. During an ice-age, mid-latitude precipitation is dramatically increased as the greatest inter-latitude heat flux is in the latitudinal range of 30-40 degrees. Heat, moving from low to high latitudes, must pass through the mid-latitudes, creating air movements, including high-speed winds and stormy weather. We should note that, in the past 15 years, the level of the Caspian Sea has risen by 2.1 meters, and continues to rise at 15 cms per year. 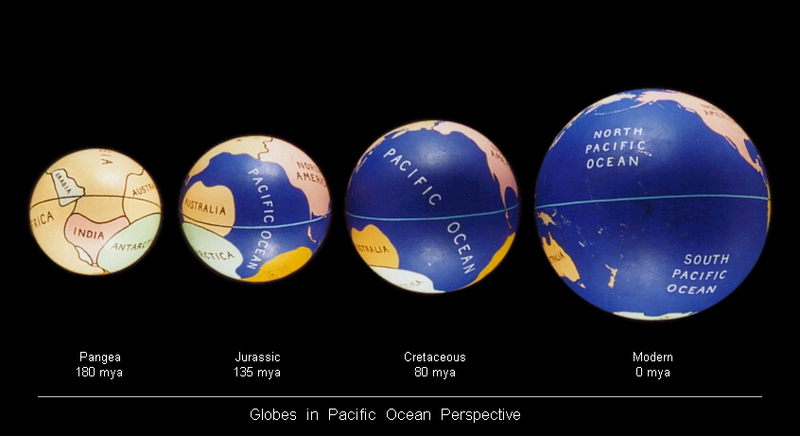 The average depth of present oceans is 3.8kms, whereas the probable average depth of Cretaceous oceans (80 million years ago) was only 2.5kms. During an ice-age, the global wind patterns change so that cold low-pressure fronts move further, from higher to lower latitudes, and warm humid high-pressure air moves further from lower to higher latitudes, thus the gas emissions and heat naturally accumulate around the Earth’s polar region. The high latitude heat-sinks become intensified. The warm stratospheric belt widens and extends lower. The warm humid tropical air moves more to high latitude sinks and less to high altitude sinks. The mixing and randomization of tropospheric heat energy becomes more pronounced, and global water precipitation increases significantly, evenly distributing the Earth’s water, setting it up for greater solar repulsion. As previous ice-age weather patterns were relatively simple and stable, we venture a preliminary deduction that present global weather patterns are peculiar to an inter-glacial period. During the Earth’s emergence from the last ice-age (which ended about 10,000 years ago), it experienced huge fluctuations of temperature and precipitation. Greenland ice-core analysis indicate that these shifts happened within a few years. The analysis also indicate that, during the Eemean interglacial period (115,000-135,000 years ago), average temperature shifted by 10 degrees C (or more) within 10 years or so. When these research findings are considered in conjunction with volcanism/ice-age correlations, we cannot rule out the possibility that an upsurge of volcanism may bring about a rapid return of ice-age conditions. As ozone is attacked by volcanism (via chlorine and sulfur emissions), ozone deletions have probably occurred in the past. And, as we now have evidence of extreme climate shifts of within less than 10-15 years, we should expand our perspective to include Earth’s natural cooling mechanisms and ventilation system – this is not a pure matter of greenhouse gas emission. As ice-ages have occurred many times in geological history, and as ice-ages are caused by de-insulating volcanic emissions, it is probable that future upsurges of volcanism will result in future ice-ages and it is unlikely that man-released de-ozoning agents will have any significant effect upon the volcanism/ice-age causation sequence. In other words, the man-release of de-ozoning agents will not prevent the occurrence of ice-ages in future. As ozone depletion has a heating effect, while the de-insulating veil has a cooling effect, the relative altitudes of the ozone and de-insulating layers, become a matter of interest. The ozone layer lies between 11 and 25 kilometers of altitude, while the de-insulating veil lies between 15 and 30 kilometers of altitude. The de-insulating veil is the higher and predominating layer and, during periods of increased volcanism, the stratospheric cooling effect predominates over the stratospheric heating effect. The lower boundary of the stratosphere varies from 17 kms height at the equator to 9 kms near the poles. This raises the question as to what height volcanic emissions must reach in order to enhance the stratospheric de-insulating layer. Winds may carry emissions from very low to very high latitudes. And as the stratospheric veil itself remains in a state of frozen and windless conditions, it is assumed volcanic ejection is the surrounding force that allows the majority of emissions to reach this height, and the sole cause of solar de-insulation. As the atmosphere is not as transparent to long waves as to short waves consequently it acts as a reservoir of heat. Atmospheric insulation causes the Earth’s surface to be about 40 degrees C warmer than it would be without such insulation. Cooling-effects from such de-insulation are in turn harmful to life, as throughout history, such heating effects of weather from inter-glacial periods have been proliferating for all forms of organic life. In an overall scenario of global heating (due to the ongoing thermonuclear core explosion) we have an increase of volcanism in the present quaternary period. This volcanism results in an increase of the de-insulating stratospheric layer of sulfurous aerosols and dust. Over the past 10,000 years of human development, there has been a lull of volcanism, during which the de-insulation layer has partly dispersed, resulting in an inter-glacial episode. Now that volcanism is increasing, this episode is coming to an end and we may expect colder average global temperatures in future, and as in the past, we should expect this to happen within 10-20 years via weather changes as precipitation is increased and water is distributed around the earth, as well as the melting of the ice caps. (Note: The above temperatures were based upon estimates of carbon dioxide in troposphere). Since the work of Budyko, Ronov and Yanshin, the presence in the stratosphere of a de-insulating aerosol layer has raised the possibility that volcanism may increase de-insulating dust levels, this affecting and increasing the levels of carbon dioxide in troposphere, these temperatures need to be interpreted with this in mind as well as our future’s. Mean surface air temperature cannot be deduced with reference to carbon dioxide incidence alone and this only serves as a general reference to our knowledge of history’s temperature, as always we should broaden our perspective, and include more clues and observations. It is interesting to note that, CFC molecules rise slowly into the stratosphere and then move poleward, being decomposed by photochemical processes into chlorine after an estimated average lifetime of some 55-116 years, man-produced, CFC’s were not released into atmosphere until the 1930s. However, carbon dioxide research shows us that carbon silicates have been present in high quantities in the past, and if we apply our current man-made emissions over today’s situation, global mean temperature is still dropping, and as mean surface air temperature cannot be deduced with reference to carbon dioxide incidence alone implies that man-released carbon emissions do very little compared to the scale of natural sulfuric emissions, and all we have done over the course of history is small compared to that of earth’s ventilation system. We also can assume our man-released emission’s affects have served to counter this insulating decrease, and thus our attempts to release carbon emission’s have only served to warm the planet, and thus preserve life, as volcanic activity releases approximately one billion kilograms of sulfur annually, as sulfur dioxide. The solution itself does not rely in carbon emission’s however, this is not implied by the Aeris Argumentum, what we have are a set of perspectives that tell a story, but ‘proof’ and ‘truth’ and ‘solution’ itself are not developed here. The evidence (of carbon dioxide levels in marine micro fossils) indicates that the previous interglacial, which ended 75,000 years ago, had high carbon dioxide levels and was even warmer than the present interglacial, but still, this was unable to prevent or preclude the onset of the last ice-age. Current high carbon dioxide levels (and their greenhouse effects) will probably not prevent the onset of another ice-age. As carbon emission’s further ozone depletion, and some scientists have commented that global warming may cause an increase in high-latitude snowfall, leading to an increase in the volume of global ice and a lowering of sea-levels. The warming caused from the greenhouse layer serves to create weather patterns that evenly distribute the surface waters, and atmospheric waters, to the point that the temporary and polar heating only influences a greater and faster ice-age like situation. As water, and ice, like a mirror, reflect solar radiation back into space, thus eventually decreasing temperature even further. A 5% drop in the amount of solar radiation reaching the surface could cause the global mean temperature to fall by as much as five degrees Celsius, and just as we have seen in the past, the Earth has, by means of carbon emission’s and water distribution, influenced global cooling drops to eventuate between 10-15 years – A cooling period only influences more cooling, what offsets these ice-ages, just as what creates them, is the Earth itself, as also noted in the past, core-heat fissures and pressure force more core-heat to the surface thus raising global mean temperature back above that of the evaporation point of water, and the process reverses and repeats. Except in the short-term, biospheric temperature levels will remain unstable for as long as volcanism is intermittent and irregular. And even though there has been a high correlation between temperature levels and carbon dioxide levels over the past 160,000 years, this, of course, is not in itself proof that high levels of carbon dioxide cause global warming or prevent global cooling, especially if we consider the predominating properties of sulfuric gasses. The warmer the oceans, the more carbon dioxide is released from oceans into atmosphere and when the ice sheets began to melt about 16,000 years ago, the quantities of atmospheric carbon dioxide increased rapidly. Marine organisms take up carbon dioxide, and the carbon dioxide of dead land organisms is washed into the oceans. The oceans act like a pump to remove carbon dioxide from the surface and from the atmosphere and abyssal waters are rich in carbon dioxide. Icing of ocean waters reduces the pump action and reduces the amount of carbon dioxide in atmosphere. It may be that, by reason of the oceanic carbon-dioxide pump, warmer global temperatures are associated with higher levels of atmospheric carbon dioxide. However, we may not logically conclude that a high level of carbon dioxide precludes a fall of mean global temperature. If a de-insulation factor causes a fall of global temperature, the level of carbon dioxide would fall. A reduction of atmospheric carbon dioxide does not cause an ice-age: On the other hand, the onset of an ice-age does cause a reduction of atmospheric carbon dioxide. A high level of atmospheric carbon dioxide does not prevent the onset of an ice-age, thus man’s attempts to release carbon emission too will not prevent ice-age onset. Again, the oceans play a key role in the global carbon cycle and we should include all perspectives of positive/negative fluctuation that affect all emissions. It is estimated that approximately 50% of carbon dioxide produced from fossil-fuel burning is taken up by the oceans. Photosynthesis by phytoplankton generates organic compounds of aqueous carbon dioxide. Eventually, some biologic matter sinks down to deeper waters, where it decomposes and oxidizes into carbon dioxide. This process transfers carbon dioxide from surface waters to deep ocean waters. Oceanic biomass ‘pumps’ carbon dioxide from atmosphere to surface waters and thence to deep ocean waters and the average time for a carbon dioxide molecule to be dissolved in the ocean, or taken up by plants, is about four years – Photosynthetic activity on land involves 50 billion tonnes of carbon annually: This represents 7% of total atmospheric carbon. The major fluxes of atmospheric carbon dioxide are a result of solution/dissolution in the ocean, and photosynthesis/respiration and decomposition by biology. The major reservoirs of carbon are in limestone sediments and fossil fuels on land, and in the world oceans. The atmosphere contains about 750 billion tons of carbon, corresponding to a carbon dioxide concentration of 350 parts per million. It is interesting to note at this point, that the burning of fossil fuels and timber may, via the Greenhouse effects, serve to partially offset the cooling effects of volcanism but in periods of average or above average levels of volcanic sulfur emissions, there is still likely to be a net cooling effect, even given present high levels of man-created carbon-dioxide emissions. The coincidence of the growing ozone hole over Antarctica and the more equatorial orientation of sulfur and dust volcanic emissions (causing reduced insulation), may have the effect of reducing the latitudinal temperature differentials even further however. There are research indications that variations in the oxygen-16/oxygen-18 ratio, in ocean-waters, provide a reliable record of global changes in ice-sheet volume. During glaciation, the lighter oxygen-16 evaporates more readily from the oceans and is ‘locked’ into the great ice-sheets. The late Precambrian ice-age (of approximately 700 million years ago) brought the greatest glaciation the Earth has ever experienced. Nearly half of the planet was covered with ice. The onset of the ice-age was probably associated with a major period of volcanism, and our measurements of oxygen-16/oxygen-18 correlate with this observation. The onset of an ice-age is accompanied by a steady lowering of global sea-levels, to approximately 650 feet lower levels at the peak of ice-age glaciation. The amount of sea-ice in the Arctic varies from over three million square miles in the summer to nearly twice that amount in the winter. The greater the salinity of the Arctic Ocean, the greater the amount of icing. As with the rest of the observations included in the Aeris Argumentum, ice-blocking of the Bering Strait would indicate that ice-age re-entry was well under way. Of the total global land area, 57,000,000 square miles, approximately 5,700,000 is presently under ice, whereas, 20,000 years ago, approximately 15,400,000 square miles was under ice. 20,000 years ago, ice as thick as 10,000 feet covered Canada, Greenland, and Northern Europe. The Antarctic ice sheet was 10% larger than its present size. Icebergs and drift-ice covered half of the oceans. During the current interglacial period, the global mean temperature optimum of 16.5 degrees C was experienced about 470 million years ago. A trough of 13.5 degrees C was experienced about 330 million years ago; a trough of 12.5 degrees C was experienced about 80 million years ago; and a trough of 12.5 degrees C was experienced from 1400AD to 1800AD (the ‘little ice age’). From 1939 to 1978, global mean temperature fell by 0.6 degrees C. Thus our increase of emissions have done very little to slow cooling trends, due to the properties of the gasses that serve to insulate the Earth as recent research indicates that decreased insulation from greater volcanic dust and sulfur in stratosphere, tends to override and dominate over Greenhouse effects, and as the mass of natural aerosols in atmosphere is estimated to be 4-5 times greater than the mass of man-produced aerosols in atmosphere, on a global scale, cooling attempts still prevail. Carbon Dioxide emission only temporary off-sets the cooling trend, to a point where it begins to lend a hand at colder progression, via el nino and increased distribution of water via weather, and thus reflection of solar radiation – Our global mean temperature still drops, regardless of our miniscule attempts to warm the atmosphere, and even when combined with the Earth’s own release of carbon silicates, the temperature continues on a downward trend. As such, future political and economic spending’s to decrease emissions are not only Ill-advised, but even futile to organic life. The greatest of extinctions have occurred during periods of ice-age, and as the heating will ultimately only influence a greater and faster cooling trend, this cooling scenario is unavoidable and now our perception will change forward and incorporate history of extinction, to provide predictive reference and inference. The first glacial period took place about 2 billion years ago, during the early Proterozoic era. Glaciations occurred during the late Ordovician (of approximately 440 million years ago), and the Carboniferous (of approximately 330 million years ago and also 290 million years ago). These glaciations seem to have been associated with substantial reductions of atmospheric carbon dioxide. There was also a great deal of subduction of ocean floors underneath continental margins. During the Phanerozoic, there have been five major mass extinctions – the Ordovician (440 million years ago), the Devonian (365 million years ago), the Permian (240 million years ago), the Triassic (210 million years ago), and the cretaceous (65 million years ago). In addition, there have been five minor extinctions during this same period. Episodes of extinction occurred roughly every 24-32 million years, and longer periods of 80-90 million years between major extinctions. Long-period extinctions may be associated with the sun’s revolution around the universe. If the solar system moved through galactic dust, this would cause cooling, and greater exposure to radiation would also be inimical to life, let alone the volcanic activity of the past. The elliptical nature of the Earth’s orbit around the sun, and also the axis-wobble phenomenon, may be contributing factors of ice-age initiation, or of temperature fluctuations within ice-ages. The maunder minimum, a 70-year sunspot cessation (1645 – 1715 AD) has been suggested as a contributing cause of the ‘little ice age’. 11-14 year solar radiation cycles from the sun also naturally serve toward ozone depletion. Studies done on past ice-ages also indicate solar cycle influence providing evidence of reoccurring patterns and measurements that directly correlate with solar sunspot cycles and periods of 11, 22 and 90 years, thus indicating a link between solar activity and Earth’s climate during this period. Solar influences themselves naturally create ozone depletion, causing this natural fluctuation of heating to cooling. The number of sunspots peak soon after the beginning of each 14-year cycle, and decays to a minimum level of activity in 11 years, naturally creating increasing ozone depletion. It is safe to assume past and present entrances and exits from the various ice-ages were not man influenced, nor will man-influence sway the galactic causation of such events to stop, our attempts are minor in the grand scale of things, and at best serve to preserve our survival, as every moment we can stall the process, gives us a moment to think, to create solutions and broaden our perspective, and instead of arguing over emission’s and laws, perhaps change our perception forward, and develop solutions to our future. Regardless of our emissions, these climate patterns and changes have taken place in the past, and are in fact eventuating here before our very eyes. We should keep our eyes forward, and hand pressed firmly against the acceleration throttle, using the perspectives we have collected to create the future. As previously discussed, rapid heating of the mantle 180 million years ago caused by the core explosion, resulted in huge volcanic eruptions and the uplifting of new lands associated with a major expansion of mantle volume and Earth surface area and thus atmospheric capacity. It also increased the carbon dioxide content of the atmosphere and created a warm, moist biosphere favorable to organic life, as the volcanic emissions stack above and beyond greenhouse capacity to influence heating, human emissions, though small in comparison, serve to preserve life and thus survival. 50 million years ago – Australia separates from Antarctica. 27 million years ago – Small glaciers are widespread in Antarctica. 10 million years ago – The Antarctic ice sheet forms. 5 million years ago – The Antarctic ice sheet expands. Temperatures beneath an ice sheet can be much warmer than the surface due to mantle warmth and to higher pressures. This causes instability of Antarctic ice, leading to the calving of icebergs. The calvings of very large icebergs have increased dramatically since 1988: This may be a sign that the Earth’s crust is warming up, due to core-explosion heat reaching the surface. The west and east Antarctic ice sheets are presently rather unstable. If, by reason of underlying melt-water, the ice sheets start to slide, the climate of the southern hemisphere would be cooled rather drastically and sea levels may then rise. A New Zealand scientist (A.T. Wilson) suggested, in 1964, that an abrupt sliding of large portions of the Antarctic ice sheet into the ocean could trigger climatic changes leading to an ice age. (Note: Such an occurrence should be seen as an aspect, rather than as a prime cause, of global cooling). The heating conditions themselves from the greenhouse emission’s only create conditions that prime and eventuate further cooling progression processes. We discuss ice sheets for the purpose to relate to solar activity and create a branch of proposition between astrophysics of Venus and Earth, due to similar thermonuclear processes, inferences are implied, and tie our propositions together. About 75% of Australia was covered by thick ice sheets, during the Precambrian ice age of approximately 680 million years ago. Lake-bed sediments, called ‘varves’, show distinct bands of mud and silt. These varves appear to mimic the solar cycle, with periods of 11, 22 and 90 years, thus indicating a link between solar activity and Earth’s climate during this period. Solar influences themselves naturally create ozone depletion, causing this natural fluctuation of heating to cooling. And as the number of sunspots peak soon after the beginning of each 14-year cycle, and decays to a minimum level of activity in 11 years, naturally ozone depletion too increases. Within Antarctica, entire mountain ranges are covered by ice up to three miles deep. The total amount of ice in Antarctica is about 5.75 million cubic miles. About 1.8% of all Earth’s water is locked up in the two polar ice caps. The annual snowfall of Antarctica is only about 600 millimeters, or the equivalent of about 75 millimeters of rain. There does not appear to be any geological evidence for polar ice, of any large quantity, until about 40 million years ago. The lithosphere is heating up, and the ocean-floor crust and deep ocean-waters are warming. The major factor, bearing on present and future world weather, is Earth expansion, causing increased volcanism, causing greater quantities of volcanic dust in the stratosphere, causing a significant reduction of insulation. The Earth has set itself up for another cooling period, it is inevitable, the surface area of the Earth is 197 million square miles and the surface area of the oceans is 140 million square miles. 71% of the Earth’s surface is covered by oceans. The average depth of all oceans is 12,500 feet. The volume of the ocean waters is 331.4 million cubic miles. As the Earth’s volume is 258,156 million cubic miles, the ocean waters are approximately 1/779 part of Earth’s volume. As Earth’s average density is 5.53, the ocean waters are approximately 1/4308 part of Earth’s mass. Earth’s mass is approx. 6,000 billion tons, of which the ocean waters are approx. 1.393 billion tons. Underground water is estimated at 10 million cubic kilometers: This is about 46 times as much as all fresh water and salt water lakes, and about 8,400 times as much as in the rivers. The atmosphere weighs 5.6 x 10 to the 15th tons, and forms an aerial current, carrying the weather from west to east. The amount of water in atmosphere is only about a one thousandth part of 1% of the total amount of the Earth’s water. If it were all condensed, it would cover the surface of the Earth only to 25mm of depth. The average annual precipitation is about 1 meter. The water vapor remains in atmosphere for an average of only nine days. The average annual evaporation from the oceans is 1.25 meters. Throughout Earth-history, it has been rare for the poles to be covered with ice but, during the past 2 million years, the poles have been continually iced, the water is continuing to spread, along with the earth’s expansion. The primary cause of this icing as proposed by the Aeris Argumentum has been the greater incidence of volcanic emissions and their de-insulating effect (via the stratospheric veil). And as weather patterns only begin to spread the water around the Earth, more and more solar radiation will be reflected, thus reinforcing cooling patterns below the evaporation point of water, and freezing would become greater and greater. Again, let us focus on the future of our network, with or without our intentions these things have happened now as well as in the past, and as such, forward thought processes should be prioritized instead of focuses of blame, as the Earth has naturally set itself up for periods of intense climate change even without human emissions. The green scheme masquerades itself in deceit, only applying a limited number of models to climate change in order to influence social acceptance, in order to generate profits – A niche/hype scheme. The whole truth is these drastic climate changes have occurred before human evolution, and supplying evidence to support a small area of blame on humanity, in turn leads to greater economic justification, however, it is not the whole truth. The refrigeration industry is one of the largest, as is the automotive industry, most socialized countries use fossil fuel burning vehicles as means of transportation, and fluoro-carbonated refrigerants to remove heat from air conditioning devices. One of the monopolizing companies involved in the production of refrigerant is Dupont, the world leader in refrigerant production, and byfar the most profitable organization in refrigeration. As 2010 nears, we welcome the new laws influenced by the green scheme, but not only does the decietful information provided to society acclude to these new laws, but Dupont’s newly invented refrigerant, which is not a CFC, also gets incorporated and pushed accross societies. Along with Duponts new refrigerant, which is 4-8x more expensive than previous refrigerants, you have a whole new line of refrigerant devices, and compressors, which have to be used and thus purchased in order to pump the new freon, and thus, next year all refrigerant problems will lead to a huge market/profit increase in not only refrigerant, but also mechanical refrigeration devices – New equipment and new refrigerant. It is the argument of the Aeris Argumentum to provide evidence, for monopoly, in order to justify deciet, and with the combined momentum of such huge organized monopolies, we have new laws, and thus we ignore the whole truth. We should look forward, past the culprits and masquerades of deceit, incorporate more perspectives, shut off the televisions or atleast question their motives, as the argued in the Aeris Argumentum, decreasing greenhouse emission only serves to cool the Earth, which it has already started to do to itself – These economic provisions are futile to organic life, and estimated dates of 10 years before these plans are fulfilled is still not enough to sway the Earth’s natural plans for itself, which according to data accumulated, should be in obvious Ice-Age status by 2020. This smokescreen only occludes truth, and points focuses of blame toward human emission in order to sway profits from a naturally occurring event. Let it be known, the whole truth is being limited here, and our emissions are extremely minor compared to the Earth’s own natural carbon and sulfuric emissions, even if we stop our emissions, the scenario will continue, and grow progressively cooler. Sites/blogs of particular interest, containing multiple perspectives on our climate scenario. Proposition of all inclusive integrally related unity of self-creation. The approach we take as philosophers is one of a technician with a tool-bag, as perspective and paradigm provide us each as individuals with a unique exposure and interpretation of the environment which surrounds us, it is the superfluous intent of the author to include all perspective as a means to the whole truth. The canvas before us is composed of individual paintings, and as such, the author strives to include all aspects of existence and proposition, both of finite and infinite magnitude, as existence is composed of finite and infinite magnitudes, thus shall the authors philosophy that makes up the Magis Apparatus – which we may now assume to be simply referred to as ‘The Apparatus’ from here on out. The approach is one of many encompassing views in an attempt to grasp the entire canvas, thus the whole truth, whereas a single perspective only focuses itself toward a single section of our canvas, and single form of truth. In turn, my tool-bag, or this apparatus rather, consists of many inclusive paradigm from all areas of mankind’s creativity, thus the term ‘Magis Apparatus’. Magis, a Latin term meaning – ‘more, to a greater extent, rather, for preference’. And Apparatus, a Latin derived word, ‘used to describe a piece of equipment designed for a particular purpose’. It is necessary to understand that from this point on, the author will switch between perspective and paradigm at almost random, as one proposition leads to the next without any ordered process to discovery, so shall the apparatus. In essence, not only shall the subject of the apparatus form proposition, but the format and style of the apparatus itself will shape a model-like network of proposition in which reflects the philosophy herein discussed and form logic through medium. Existence knows no bounds, and therefore either does philosophy. It is my intent to provide technicians with more tools, it is also my intent with the preface to help the reader understand that undeniable proof of any proposition is still unobtainable, be it the ones formed within these pages or the ones formed without – the intent of our philosophy is not to prove, as proof, and truth, are unique to our interpretations and perspectives, and so we shall begin a effort and means to provide more tools and thus more inclusive integrally related perspectives, as existence is a all inclusive integrally related set, and in order to see the whole picture, we must then expand our perspectives, our tools. In turn, the apparatus is a navigational map – a collection of tools. It is also to be made aware that as we are human, we learn by opposition and reason of apparent absence, it is by this that we progress through time towards our means, we have learned through obstacles and always created means around them, we cannot know light without knowing dark, and so throughout the apparatus we apply syllogism and logic that is required to interpret both finite and infinite expressions of existence and change between them with spontaneity. The apparatus is a double-edged knife (a tool) that cuts with one side, or the other, and sometimes by using both. It is a set of tools, a set of perspectives, finite, infinite, and transfinite, attempted to be converted into a single language (Western English) that heavily relies on finite paradigm – hints the format of the Apparatus. This is why the author formats the apparatus as though it is a directory, or network, similar to the shape of a tree, and we proceed from seed, to plant, to tree, to fruition, as one proposition leads to the next and in a numbered yet, at the same time unordered and unprocessed fashion, which is used to lead and point to the logic of infinite paradigm, which is random and disorganized and thus chaotic and without process or pattern. This is to demonstrate the all inclusiveness of existence, as a single set, a whole that consists of both finite and infinite expression. Even though we have a ordered apparatus, we also have random developments of proposition throughout it, explained in many formats and perspectives, but they all reinforce each other as a single whole. And, throughout history philosophers have used format to further convert and convey their thoughts. Even though each text is open to be individually interpreted by the uniqueness of the reader’s mind, which is unique of mine, and thus unique in perspective of mine, it is the intent of the apparatus to include extra perspectives for the reader to interpret individually, and thus further upon in their own paradigm of existence by doing so. It is a algorithm, a paradigm, a gestalt, a pattern, a extension, and a tool. As finite logic is required to view the finite aspects of existence, by the same token, infinite logic is required to view the infinite ones, and thus we have the human, transfinite device, who can switch between views, and so we will now. The instructor waits as the class individually reacts to his expectations. As existence is of two separate magnitudes: finity and infinity, the one leads to the two, and we can begin to form a logic of interpretation, since existence is composed of both infinite and finite expression, we can now apply our logic, and assume existence is atleast of infinite circumference, because if its circumference was that of finity, it would not achieve the capacity for infinite circumference. This means that even one infinite aspect of existence is enough to force the whole thing to infinite proportion following our basic logic and premise. This allows us to begin using both finite and infinite logic, as tools, to apply our, and to our model. Existence is a infinite, all inclusive set – a infinite set. And it’s sub-sets are that of converted finity. Thus powers of infinity, thus Aleph-Powers and infinite set theory developed by George Cantor. Together, George Cantor, and Bolanzo, have discovered the proportion of our system. Cantor shows us that infinity cannot be measured, only compared, and since we can compare the infinite set to its sub-sets, that is to say, we do have infinite qualities in our experience (love, compassion, beauty, cohesion, ect, all things that cannot be measured), we can now proceed with Bolanzo’s assumption, which is, that simply one infinite aspect of existence is enough to force the entire proportion of the entire set to a single whole of infinity, and that finite form is only a matter of our perception, as the whole is all inclusively present within each of its separated parts, thus powers of infinity. Infinite expressions cannot be measured, only compared, and are of mind. Since existence is a inclusive and integrally related whole (or infinite set), the fact that humans (conscious beings) can learn, and absorb quality (infinite expression), from the environment (mass, finite expression), means that infinite capacity must also not only exist in the environment as existence is again, a single whole that only appears to be separated, but infinite capacity also exists in their minds (Are you getting the whole picture? Mind? Environment? Capacity? Paradox? Dream? Reflection? Duality? Cohered positive and negative form? The electron? ), and the human is only a monadic extension of the environment, a reflection of paradox that converts between. It is interesting to note the Electron, it does whatever it likes, it moves at any speed whenever it wants, it moves forward through time, or backwards, you add up the amplitudes and you get the wave length. Yet for some reason, it, the electron that is, willingly coheres itself, thus creating the finite form before us, at the speed of light – Where there is a will, there is a way. The brain, physically, is not of infinite proportions, this is because the brain is only a tool used to interpret, thus process and collect from the environment around it. Like a dam, it hinders and collects energy from the flow of the infinite ocean of conscious awareness, and as each is individually shaped, each ones limited perception of the environment too is individually shaped. Thus humanity’s purpose is one of a conversion process in the discovery of self-awareness, as the environment is externalized unaware form, and the quality the human has infinite capacity for is a infinite and internalized form. It can also be assumed, that since this is humanity’s purpose, and thus reason for expression, and since nothing is expressed without purpose, and deep in the ocean where there is no light we coincidentally do not find anatomical eyes, that conscious life outside of human form will not be found, as we already contain that purpose, and instead we find ourselves. Finite expressions, such as those of mass, can be measured. The instant mass is created, space is created, time is created, one cannot exist without the other for the purpose of finite expression. And so this is a isolated, all inclusive, integrally related, system, of conserved energy, where things are not created or destroyed, simply converted, E=MC² . Implicative unity is thus implied. Intuitive inference is implied with infinite paradigm. Implicativeness is thus implied with infinite paradigm. Powers of infinity are implied at all times. Existence is of two different magnitudes – Finite and Infinite. Since existence includes infinite magnitude, and finite magnitude, in order for infinite magnitude to exist, the entire proportion of existence must then be of infinity, since one of finite proportions could not encompass the circumference of infinity. Finite expression is thus a sub-set of the infinite main-set of existence, and all of existence is a single, integrated, infinite whole, it’s sub-sets only appear to be separated in finite form. Everything is expressed with all inclusive purpose, that is to say, everything has purpose, even the idea of non-purpose, thus has purpose. As such, nothing is to be ignored, quality is everywhere. Finite magnitude consists of all mass, and thus space, and thus time. Finite expressions can be measured – The creations of finite syllogism and logic, which are simply a matter of perspective, and thus paradigm, allow us to formulate from inferences in the environment of which we interpret around us with our human form, and thus mind. Mass is a condensed container of quality. Human’s release energy from mass over the course of time through their creative means, E = MC² , where E is Energy, M is Mass, and C is the velocity of light, the energy released from mass is sent from a potential condensed state into a infinite kinetic one through human interaction and creativity, and thus human’s release quality from mass, as quality is the paradoxical indirect implication of mass. Releasing energy from mass requires the same input of energy in order for release, thus conversion. Throughout history mankind has created faster and faster ways of releasing energy from mass, with the pinnacle being the physical sciences, which is of finite paradigm, a perception that has gave birth to the most recent and powerful creations, including the nuclear advent, which is a area of knowledge that is solely composed of releasing energy from mass. As more and more energy is released from mass, the environment becomes more chaotically organized to reflect this, and we grow more aware as things speed up toward singularity. The nuclear advent released so much energy from mass at once, that our studies have now lead us into a realm of harmful realization. That is to say, our creations from this point on will encourage chaotic singularity to the point where it is physically harmful to the entire species. As natural selection does not apply to humanity, as we create our own condition, it is often the weak who survive now, and the strong that which do not. Our creations have allowed us to realize that we can create our own condition. Physical survival has always been our main priority with all creations, but as time goes on, and awareness of our true and infinite nature increases, finite survival will wane, and infinite survival will wax. It is safe to assume, our creations of the internet, and collective developments of thought, are this process, as with all of creativity, we are working towards our infinite nature, until the entire body is no longer needed, and thus re-created. We create our obstacles, mass volunteers into form, the electron of which can slip back and forth, in and out of time, speed up and slow down, willingly coheres form before us. We take the amplitudes and arrive at the wave length. Where there is a will there is a way. And as such, our will is to discover ourselves, hints the finite environment. The environment is our egg (including earth), and as we consume it, we develop and hatch into fully realized beings. All entropy is an effect of humanity’s every increasing awareness of it’s self-created nature. As humanity becomes increasingly aware of it’s self-created nature at a ever increasing exponential rate, entropy thus increases at a exponential rate, that is to say, finite chaos and infinite awareness are increasing (being achieved) at a exponential rate. It is a inverse relationship of curves, of finite cohesion lost and transfinite cohesion gained, extending from the beginning of time, to the end. It is only the past 200 years we have created most of our inventions, and it is only the past 200 years we have become most aware, and only the past 200 years we have rearranged the environment the most (40% of world forests have been converted into creative means) and the process continues, always gaining speed, in turn conflict too grows in order to eventuate this accelerating and increasing release of mass. Infinite magnitude consists of quality, no time, no space, and of mind. Infinite expressions cannot be measured, only compared. Infinite syllogism and logic implies intuition and implicative unity. Infinite quality is being gained at ever increasing exponential rate as humanity releases energy from mass at a ever increasing exponential rate, that is to say, the environment is that which we do not know and externalized (finite). We learn through conflict and differentiation with the environment, and that which we do know, is internalized (infinite). As all quality is of mind, it exists outside the separated form of mass. 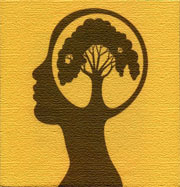 All quality and characteristics are formed in the mind, as sensing is thinking. Seeing is thus, thinking, and every other method of absorption, is all thought-together. As we are all sovereign beings, composed of the same infinite whole we only think we are separated from, all is agreement. Every collective agreement, is just that, an agreement. All things are individually experienced, in the individual’s unique mind, and just as all things are different, so too then are our perspectives in which we think together, and thus create the environment around us instantaneously every moment. This constant fluctuation between singularity, and separate, at the speed of light, that is to say the will of the electron to pop in and out of time and cohere form, create a inward pull towards singularity at all times, thus Gravity. As mass is voluntary cohering together at every moment through our will, and thus resisting singularity, a tangential force is created in response to that resistance, thus the pull of Gravity. Everything is being pulled towards singularity, and by our creative means we move forward and toward singularity as well. We literally, create our way toward it, all of our inventions, from cooking, to the nuclear advent, have all been ways of releasing energy from mass, and thus in support of environmental conversion, hints the decay of all particles or entropy. A vortex of awareness grows, rearranging all mass into its singular chaotic state of infinite proportions. Once time runs it’s course, all will have been absorbed and internalized and converted,, all energy released from all mass, all things created, and thus complete awareness of our creative nature will be obtained. As mass is a condensed state, one that resists singularity, it serves to obstruct, and thus differentiate in order to be learned from. Social structures of organization are thus, the same force of negative entropy. That is to say, freedom, and awareness of our sovereignty will not be a matter of organized peoples, it is the awareness of our true chaotic and infinite nature as a group of sovereign beings as a whole, it is the entire collection of all things made aware individually and internalized. That of which cannot be measured implies quality, including love, compassion, hope, faith, tolerance, beauty, ect, and all quality. It is all these qualities that a being must become aware of, and thus create, it is not a matter of government force, which serves to obstruct and organize, in order for our creative means to surpass. Since all is inclusive, all is created, or rather, self-created. We learn by differentiation, the mind gives form, and differentiates and a opposes through conflict. As such, we cannot know light without dark, freedom without constraint, compassion without suffering, hope without loss, faith without lack of faith, and general separation implies a forward movement in awareness toward singularity, cohesion and love, at all times. From imperfection, we arrive at perfection. Expression is of will. Humanity’s consciousness is a state of sovereign will, and thus a monadic extension of will. And as all is willed, all is wayed. The human role is a function of creative will, a monad or unit of will, towards complete creativity, and thus complete awareness. Finite externalized mass is converted to infinite quality, and transfinite awareness is self-realized through monadic units of will, i.e. humanity, via creativity, and fluctuation of all that is unknown, is externalized, then internalized and is known. Expression of everything then must be expressed. This includes all expressions, from suffering, to loneliness, all is expressed as obstacle, as organized form, and through conflict it is then converted into internalized form, and quality is gained, and awareness achieved. Humanity is the creator, the artist, the will, in the creators separated unaware state. We did not erase our memory, this is not a case of self abuse, this is a case of self awareness. As such, it is assumed, the creator is becoming aware because he previously was not, and just as we are. Everything is thought. I think therefore I am. We think our perception together thus creating realities of our own. As all is all before us, in a state of singular inclusiveness, it is our paradigm of thought that develops the patterns that make us pick out the stimuli and gestalts of here and now, and coordinates directly with a monadic extension’s level of self-awareness, we only have access to what we need, but progress always. Self-Creation is everywhere, in ideas, and in organic life. As we become self-aware, we become aware more and more, that is to say, faster and faster, of our self-created nature as we see it more and more. And so we create it, more and more, and faster and faster. The process is that of entropy. As time goes on, entropy grows larger, that is to say, chaos grows larger, along side awareness – Our awareness creates entropy. A single state of chaos. As the environment loses cohesion, internalized realization gains cohesion, awareness is achieved, and there is no need for organized negative entropic force. A self-realized monad of will, that is fully aware of it’s sovereignty, will not be governed, that is to say, it will not allow itself to be governed, because it no longer needs to, and thus it will not create it, or externalize it, because it is already internalized, and forms of constraint no longer serve a purpose being externalized. It is the collective awareness of all monadic extensions of will that lead to a fully self-realized state of sovereignty, and thus true freedom, that is to say, a state without constraint. Negative Entropy is that of organization, and is a temporary state, this includes all forms of positive and negatively cohered form – all mass. As well as all organized social constructs, including government. Positive and Negative charges were cold-set into form, literally ‘shocked’ into existence, when the absolute heat of the creator met the absolute cold of the void, this process eventuated as the big bang. Such a large release of energy, forced all form into positive and negative duality as it met the nothing, and like a artist who blows a bubble out of molten glass, it cold-sets into form. All fact, all proof, is a matter of convenience, as all is integrally and inclusively related, and as one proposition leads to the next either directly or indirectly, we essentially have a infinite number of empirical evidences we can provide to conveniently attempt to define proof and support any hypothesis, but all we are really doing is self-explaining, thus not ‘proving’, as all is tautologically inferred, and expressed, and referenced, all we do is take a piece of the same thing and use it to describe a part of the same thing. Fallacy, and quantity, do not create content of quality, and ‘not-proving’ something by means of definition, via symbolism, does not in turn ‘prove’ something else, as symbols do not contain quality, quality is of mind, and exists outside of the symbol. Perception is to language, is to logic, is to paradigm. As sovereign beings we are all free to create our own, as such we create our own reality. The human device is capable of traveling between realities, and the apparatus attempts to provide a map. Often, what is not said, is indirectly said. Conflict equates quality, quantity does not equate quality. Repetitious acts of quantitative expression, such as reading, never equate to the true teacher of experience, of that which is conflict. Often those around us, such as publishers and academic salesmen, seek to prove, but only dis-prove through acts of fallacy, and often try to elevate themselves above the will of another by means of quantitative success. But as equals, those who do not accept each other as equal, and therefore of them, will never accept their ideas. We are all sovereign, and to accept the will of another is still an act of sovereignty. A true aspirant craves and thus seeks conflict. We are all hungry for conflict. Conflict releases energy from mass, and equates quality, and thus awareness. Conflict leads to more quality, and more proposition. One proposition leads to another, directly, indirectly, or both. And we create, all fields grow complex until they turn into a new field. From one thing, we go to the next, by creative means, with self-survival and self-awareness our guide at all times. Through conflict, our creativity will grow, to such a point, where instantaneously we will create our will. Physical sciences will allow us to further our creative means so quickly, that one day, we will re-create ourselves. Drawing vector lines forward in time, from our current fields of creativity, and under the same premise of exponential increase in manifestation, show us anything is possible, and we will create it. We are self-created beings, who have self-created everything, instead of focuses of mourn and regret, we should take our model, and focus on how to create the future we can now see by using it as our guide, because we can and will and do create everything. That is not to justify compassion, it is simply another perspective in which to view any given and unfortunate situation. We should keep our hand pressed firmly against the acceleration throttle, and our eyes pointed forward at all times. It is those who think they know something, that stop searching. We should have faith in ourselves, and in each other, instead of in our loneliness. We are equal, and as equals, we are all of each other, when we look at someone else, we should look at them as we look at ourselves, as infinite and absolute sovereign beings who share the same all inclusive and infinite properties we do. Memorable Quotes from the film, Waking Life (2001), by Richard Linklater. Paradigm – I think therefore, I am. As is the case with all of humanity, all is thought, and as such all is before us, it is only our paradigm, that forms our perception, and allows us to pick out the stimuli and response patterns of the ‘here and now’ from all that is infinitely before us. Human’s at this point start void of paradigm, logic, and language, but it is in this order that the latter is developed. Thus perception itself is derived from paradigm. It is thus implied that switches between paradigm are required to view the entire whole truth, and thus the entire picture. Whereas a single paradigm is only good at viewing one section of the whole truth. As language, logic, and thus paradigm are what allow us to perceive, we are to look at paradigm as a tool in which to utilize to perceive. All is before us, in a single homogeneous flux of infinite energy, it is our minds that pick out the ‘here and now’ of time, the stimuli and response, as we move ourselves through time we literally paint upon the void that stimulation and response, and we perceive and interact with sections of a infinite whole that only are being perceived as separate. Empirical Evidence – As all is thought, and access to quality is thus limited by paradigm. As plato pointed out with his dialogue ‘Theaetetus’, knowledge is from perception. As such, we have a infinite number of empirical evidences to support any one hypothesis. Any premise is directly related to paradigm, and paradigm is of sovereignty and individual experience, and so each premise is of individual paradigm and experience, and until we have a solid premise, all conclusions are equally as deniable as their premise. Fallacy, and plays on language, and attempts to ‘dis-prove’ do not in turn ‘prove’. All is tautologically inferred and referenced, and all we do is take a piece of one thing, and use it to provide ‘evidence’ of a part of the same thing – nothing is actually ‘proved’ in terms of infinite paradigm. And as all proposition is derived from other proposition, be it of direct or indirect influence, we in turn have a infinite number of propositions we can justify our hypothesis with, as they are all linked in one way or the other, you can just work down the chain ultimately reflecting all proposition in means of support. Thus, all conviction, and conclusion, is a matter of perception and persuasion, and as such, a ‘battle of words’. Cohesion – Cohesion, or what ties everything together, is currently split between two realms of magnitudes – Finite and Infinite. Cohesion from one realm is moving to the other by means of human creativity and metamorphosis hints entropy, a German derived term meaning conversion. As time unfolds, cohesion from one magnitude gets converted to the other via release of energy from mass and creativity. Through this process, the human transfinite device converts cohesion from one magnitude to the other. Energy is released from finite mass via conflict with the environment and creative means, the human device then absorbs this quality, and internalizes it in a infinite form. The environment then reflects this change, as cohesion moves away from the externalized environment, and into the infinite internalized realm of thought. Cohesion in terms of finite expression is the will of the electron, to constantly refresh form before us at the speed of light. Cohesion in terms of infinite expression is love. Negative Entropy – Negative Entropy implies all organized force of finite expression. All organized force, and conservative ideology, seeks to organize and cohere a state of non-chaos and thus serves to obstruct and resist the creative side-effect of entropy and thus progressive self-awareness. All obstacles are to be over-come by creativity. As all nuclear particles decay, and all mass is rearranged into a single state of chaotic and infinite unity, all mass thus decays over time, and releases quality over time, all obstacles and creative means around them are thus a matter of duration, progression, and time. Monad – Monadic extension implies inclusive will, thus the state of consciousness. 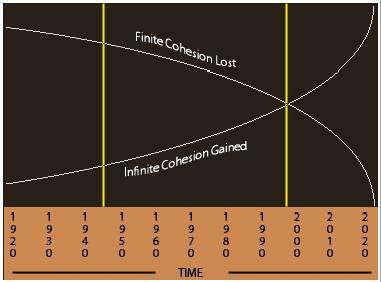 If one could zoom down on any object, past the point of finite cohesion, you would arrive at the Monad. Monads volunteer into existence through their sovereign will, just as the electron ‘wills’ itself to pop back into time and continue it’s orbit and thus cohere form before us. All is a matter of will and faith, thus the Monad. Monadic hosts such as those of humanity, are given a physical body, and the ability to express their sovereign will themselves through it. Particles and waves, however, cannot be observed with the human eye, as we are limited to 5 senses, our only method of observation is to bounce electromagnetic radioactive particles off these pieces of existence with special microscopes secluded in tight vacuums. What we ‘see’ is a colorless photo of the results of the electromagnetic radiation bouncing off a conductive surface. Transfinite – That which can convert finite into infinite. The human device. Mass is finite. Quality is infinite. Awareness is transfinite. In infinite set theory, transfinite numbers include the aleph-series, the power of which we raise infinity to, however these numbers are not finite, thus the term infinite is often used to describe the transfinite. However, in the case of humanity’s progression of self-awareness we are to differentiate with the term Transfinite. Quality – Quality implies all experiences of which we attach to symbols. Quality exists outside of all symbols, just as with dreams, quality exists outside of all mass. Quality is unmeasurable, thus quantity does not equate to quality. Quality is ‘of-mind’, Love, for example, is quality – unmeasurable, and exists outside the actual symbol it is attached to in the mind. Quality is unlocked via paradigmic switch. We are surrounded by quality, however, in order to perceive it, changes in paradigm must be invoked, and thus changes in logic and even symbolism. Proposition – All statements are of proposition. All knowledge is thus of proposition. Proposition is formed from other propositions, directly, or indirectly. We can start with any one proposition, and begin to proceed to the next, as they are all linked. The proposition of Light, thus indirectly involves the proposition of Dark. All proposition is in the shape of a tree, all linked, yet in a unordered fashion. It seems we all start out on different ‘branches’ of the tree, and work our way from one proposition (leaf) to the next, gathering quality,recreating it,expressing it and learning are thus the same process, of which conflict provides, and thus experience is the greater teacher always in life. As propositional formation often involves paradox, we too learn by reason of apparent absence, and it is by opposition that we prosper to singularity and view the entire tree, you cannot know light without dark. All creators are of reference and acknowledgment. All proposition. All discoveries. All things. All statements. All imaginations. All fields. All forms. George Cantor, Bolanzo, Plato, Rene Descartes, George Graves, Aristotle, Albert Einstein, Thoth, Anaximander, Pythagoras, Thales, Anaximenes, Theophrastus, Leucippus, Democritus, Epicurus, Leonardo Da Vinci, Josiah Royce, Johnathan Swift, Archimedes, philosophyforum.com, Soren Kierkegaard, Immanuel Kant, Bertrand Russell, Edward B. Tylor, G. H. Dicke, Emile Durkheim, Fred Hoyle, Rudolf Steiner, Friedrich Nietzsche, Thomas Aquinas, St. Augustine, Francis Bacon, Mirza Husayn Ali Nuri, Moses, Zoroaster, Buddah, Jesus, Muhammad, Simone de Beauvoir, Jean-Paul Sartre, Ayn Rand, Ivan Pavlov, B. F. Skinner, John Locke, George Berkeley, George Gamow, Noam Chomsky, Karl von Clausewitz, Leon Festinger, Jean Piaget, Thomas More, Mao Zedong, Karl Marx, Auguste Comte, K’ung Fu-tsu, Hsun Tzu, Emmy Noether, Jeremy Bentham, Edmund Burke, Nicolaus Copernicus, Vladimir Tatlin, Edgar Varese, John Cage, Max Horkheimer, Pablo Picasso, Norbert Wiener, Diogenes, Jean Arp, Tristan Tzara, Charles Darwin, Roland Barthes, Thomas Bayes, H.P Lovecraft, Jean Buridan, Jacques Derrida, Edward Herbert, Machiavelli, Pierre-Simon Laplace, John Dewey, Socrates, David Ricardo, Hegel, W.E.B Du Bois, Frederick Douglass, Gaetano Mosca, Vilfredo Pareto, Ralph Waldo Emerson, David Hume, Adam Smith, Rudolf Julius Emmanuel Clausius, Voltaire, Ludwig Josef Johann Wittgenstein, Edmund Husserl, Alfred Schutz, Arthur Schopenhauer, A.J. Ayer, Karl Popper, Helen Petrovna Blavatsky, Henry David Thoreau, Alexis de Tocqueville, Dave Draper, John Long, Abraham Maslow, The Cat in the Hat, Carl Jung, Kurt Godel, Alfred Tarski, Brand Blanshard, Werner Heisenberg, Niels Bohr, Friedrich Wilhelm Joseph Schelling, Sigmund Freud, Robert K. Merton, Shakespeare, Thing 1, Lodovico Castelvetro, Peter Abelard, William of Ockham, Herbert Spencer, John Stuart Mill, Robert Owen, St. Paul, G.E Moore, Fredrich Wohler, Henri Bergson, Hans Driesch, Louis-Victor de Broglie, Max Weber, Spinoza, Alfred Adler, Margaret Murray, Mary Wollstonecraft, William Blake, Thomas Paine, Thing 2, William Godwin, Patanjali, Zeno, Parmenides, Drunvalo Melchizedek, Theodor Herzl, David E. Cooper, Niles Eldridge, Kwame Anthony Appiah, Henry Louis Gates Jr, Raymond Williams, Rosemarie Putnam Tong, Leo Strauss, Richard Tarnas, Robert L. Heilbroner, Harald Fritzsch, Robert E. Goodin, Richard L. Gregory, Roger S. Jones, Carole Wade, Hutson Smith, Melanie Klein, Donald W. Winnicott, W.R.D Fairbairn, Karl Jaspers, Edwin Hubble, Vincent Van Gogh, Edvard Munch, El Greco, Beethoven, Kurt Cobain, Kim Gordon, Lee Ranaldo, Frantz Fanon, The Little Engine that Could, Eugene O’Neill, Benito Mussolini, Henri Matisee, Alexander Hamilton, James Madison, John Jay, Richard Linklater, Thurston Moore, Charles M. Schulz, Charlie Brown, John Martineau, Miranda Lundy, and everyone and everything else. Reasoning, logic, perspective, and paradigm can now be viewed as tools to be used by intuitive, feeling, sovereign beings, in order to pass through and create their own realities. The information contained within the apparatus is by no means all that is. The network of information here could be continued and furthered, and if the reader is skilled enough, even drawn into the future, but the apparatus as it is, is simply a piece of the pattern, a starting point, a building block, a key, that should suffice in unlocking the reader’s recognition skills of both infinite and finite magnitudes, and should be used to further the reader’s creative ambitions. However, the geometric pattern located at the bottom of this page, unlike the apparatus itself, does contain all information. This symbol, which is commonly referred to as the Flower of Life, can be found all over the world in ancient histories and cultures that have long disappeared, the earliest of which is Egyptian drawn. 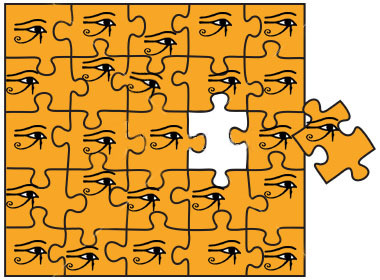 In Egyptian mythos, we learn of the God, Thoth, whom of which introduced writing to man, and also taught him this pattern. According to Thoth, this pattern contains all information, directly or indirectly, and all proposition can be derived from it, it is an artifact, and in the apparatus’ case with the reader, it is meant to be studied upon by the reader in order to provide a visual gestalt pattern in which to apply to the information read and derived from the apparatus, in order to allow the reader to further it’s all inclusive paradigm of thought and see the whole picture. As of today, and through countless combined hours of collective meditation on this symbol, the flower of life, we have found all physical laws, the platonic solids, all shapes, all musical harmonies, all wavelengths, and much more.. It is safe to assume we will always be able to apply everything we learn to this model, as it has worked thus far. Feel free to draw one with a compass as shown below. Curves of cohesion gained and lost throughout finite and infinite magnitudes via observation of entropic and negative entropic force. Curves are based off the release of energy from mass or creative output of humanity, the pinnacle of which was the 1945 nuclear advent (noted by a yellow line), when creative output and release of mass became, and thus becomes, exponentially increasingly harmful to all forms. Curves follow a exponential increase/decrease after the 1945 creative peak, to the point of instability around 1998 (noted by a yellow line). All mass is converted/absorbed roughly around 2020. Finite cohesion includes all of mass, including population and stability. Infinite cohesion implies quality gained, thus transfinite awareness, including the development of fields of automation, robotics, prosthesis, nano-technology, and replacement of population via creativity, thus self-awareness. Prediction based off the graph should be given a 8 year span in either direction, totaling to a gap of 16 years. Thus complete absorption is to take place between 2012 and 2028. As Philosophy, which is a study of existence, and thus of all magnitudes, finite and infinite, proof and truth are not our inspiration nor our motivation, our ability to create, and in particular create the future, is all that will determine if our truth is reliable. With the graphs of cohesion and chaos, and gathered knowledge from historical observation, we can compare histories point on the graph, with our own, and even our futures, in order to predict. To predict is to create, and only time will tell if the perspectives and information provided within the apparatus are useful and thus truthful. But the intent of this device was to provide the reader with a much broader perspective, a new tool, in which to interact with their experiences and future observations, and even create and compare and extend their network into the apparatus’, a skilled enough aspirant can predict the change of the environment with the curves and building blocks provided, there is a pattern here, and nothing more.